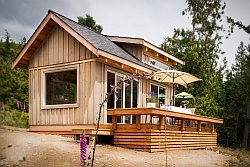 This distinctive cottage sits in the west coast rainforest facing the waters of the Salish Sea. It is located on Lummi Island in Washington, a short ferry ride from the mainland and a couple hours drive north of Seattle. 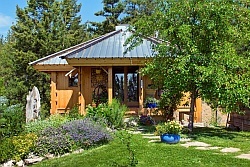 The tiny cottage recently came on the market with an asking price of $395,000. 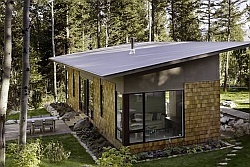 Although it is being marketed as a vacation cabin, it is on the electric grid and equipped for full-time living. 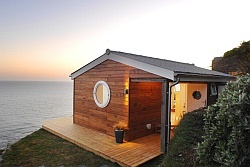 One catch is that while the cottage does have a bathroom, it is located in a separate outbuilding up the hill. Reaching it at night requires navigating not only a loft ladder but also over thirty exterior steps. On the plus side, at least it isn’t a rustic outhouse; the washhouse is finished just as nicely as the cottage itself. Besides the bathroom with large shower, the washhouse also has a compact stacked washer/dryer. The cottage is listed as being 458 ft2 (42.5 m2), which likely includes the washhouse. 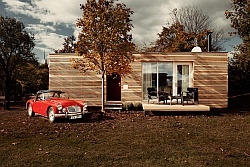 We estimate the main cottage to be about 14′ by 18′. The lower floor is one open room with the kitchen and storage closets along the back wall. There may be a wood stove in the one corner that can’t be seen in the photos as the exterior shots do show a chimney in that corner. Otherwise there are electric baseboard heaters. The outside of the cottage is distinguished by a (relatively) large roof lantern, an architectural feature more commonly associated with large barns and older factory buildings. Raising the center of the roof provided the necessary headroom for the loft bedroom. A skylight strategically positioned above the access hatch saves you from bumping your head on the way up, while a matching skylight on the other side provides a view of the night sky from bed. If the bathroom situation and the price tag don’t deter you, you can get more information through the listing agent [Update: It has been sold]. Enjoy the photos! 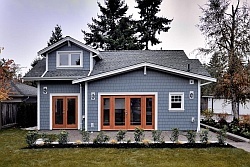 Photographs courtesy of Northwest MLS / Windermere Real Estate/Whatcom, Inc.. Via Curbed Seattle. I always marvel at what money can do. I thought I would see more “Minimalistic”, easier on pocket, owner built alternatives? ?